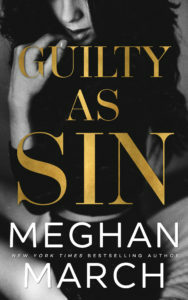 GUILTY AS SIN by Meghan March is LIVE! It’s no secret I’m a huge fan of this author; however, there’s always that thought in the back of one’s mind as to whether new books or follow-ups will live up to your expectations. Is there a limit to creativity? It seems March’s is boundless. Her writing, storyline and characters don’t just enthuse, they dazzle. As per usual in all of her series, cliffhangers are the name of the game. To my surprise, Guilty As Sin doesn’t exactly begin where Richer Than Sinner finished. We are taken back in time and not with Lincoln’s words, but Whitney’s. Flashbacks continue throughout the book from a dual perspective which was for me of extreme importance. Not in the slightest bit confusing and very well construed, it helped me understand how both her protagonists felt about a past omnishambles, a family feud totally out of control, and the present…get ready for more twists than turns. In the heat of the moment, how often do we let go of our anger without taking into consideration the feeling of others? Then regrets set in and it doesn’t matter how hard we try, if you’ve hurt someone you love, earning their forgiveness isn’t just saying sorry. In Lincoln’s case, the only way he could convince Whitney of his regret was by showing her he’d move mountains. Hmm…a metaphor impossible to achieve, he’d still do his utmost to protect her from any outside interference without invading her space. Contrary to the first book which was very character driven, in this installment plot complexities abound. And although his stance never wavers towards his family, the legacy is questioned in more ways than one. I really liked how Whitney pulled herself together and Lincoln…just wow! He demonstrated to me he’s one of those rare species of men who could put himself into the position of the woman that’d beguiled him from the word go. He discovers those lost years without her weren’t as he thought, is astounded by her natural gift that hadn’t been able to flower as it should have, even encourages it and learns how she was treated. Whitney changing her attitude was crucial if she wasn’t going to be walked over. 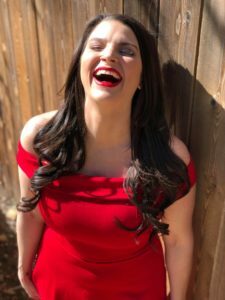 Her positiveness made me want to jump into my Kindle and give her a high five; nonetheless, a certain manipulating individual is on her heels ready to disrupt the status quo. Halfway through the read and it looked like everything was moving in the right direction. I could have kicked myself because there was no way March would ever let her readers off so easily. She cannily gave me reasons for being optimistic; Whitney and Lincoln began to relax with each other, their dialogue’s lighter, witty remarks are shared and I could see her slowly giving in to his charms. And all I’m going to say about the frisky scenes is HOT, HOT, HOT! Then a bombshell’s dropped and that is when the pace of the story really picks up and complications set in. If you’ve read Richer Than Sin, I have no doubt you’ll be itching to get your hands on this one. March has once again delivered a thrilling angst-ridden read, her side characters are either lovable or you want to strangle them with your eBook reader cable charger! I can’t thank the author enough for not making us wait too long for Reveling in Sin, coming 23rd October ‘cause the cliffy, deary me…just wait and see! Bravo! No matter who or what stands in our way—this time, she’ll be mine forever. Previous Previous post: FLIRTING WITH FIRE by Piper Rayne is LIVE!